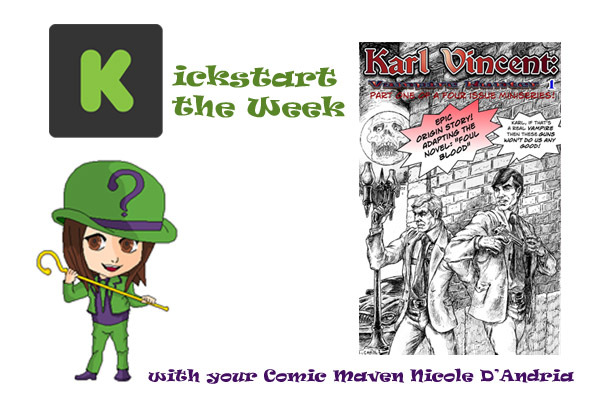 Comic Frontline: Kickstart the Week with Karl Vincent: Vampire Hunter: "Foul Blood"
Kickstart the Week with Karl Vincent: Vampire Hunter: "Foul Blood"
This week I’m showcasing the Kickstarter for a comic book mini-series that is also part of a series of novels and is becoming a film as well. 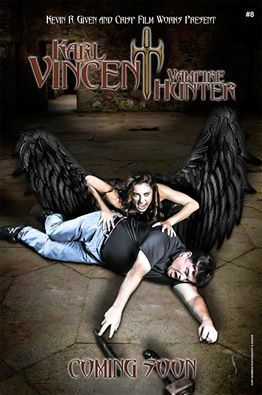 I interviewed Kevin Given, the writer and an actor, to learn more about Karl Vincent: Vampire Hunter. Karl Vincent: Vampire Hunter: “Foul Blood” is an adaptation of the second book in the Karl Vincent: Vampire Hunter book series. 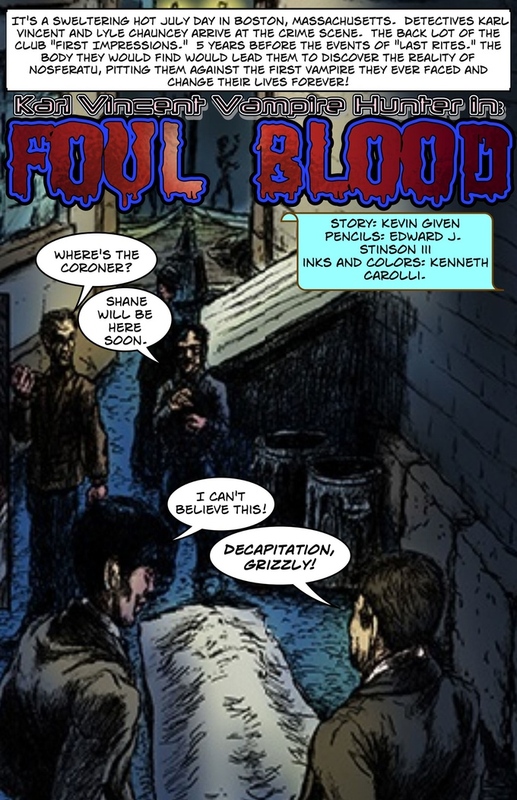 Foul Blood features the origin story of how Karl became a vampire hunter. There are decapitated bodies drained of their blood behind the night club “First Impressions” and Karl believes the culprit may be David Reynolds, a serial killer he arrested who escaped. Or is the killer of the fanged variety? The original novel series was written by Kevin Given and the comic book adaptation will also be written by him. 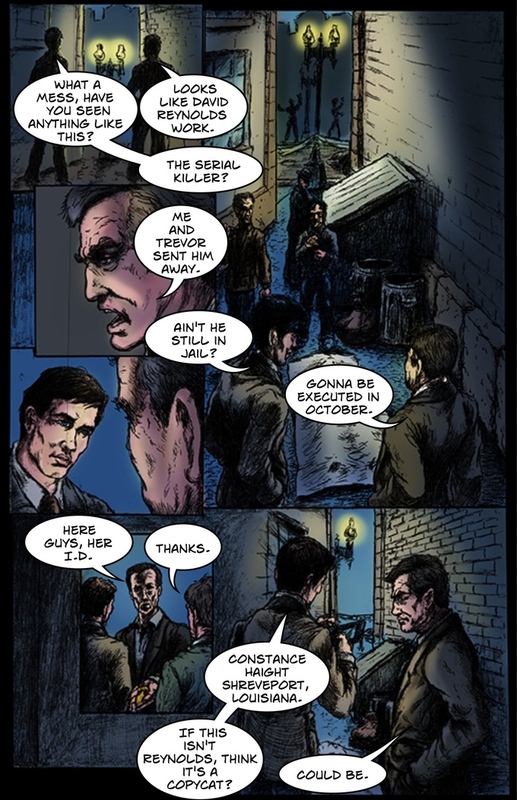 The penciler of the project is Edward Stinson III and the inker/colorist is Kenneth Carolli. 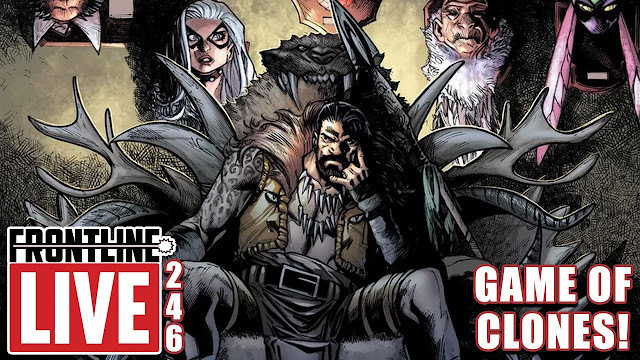 This particular series has not been completed yet, but Given is currently writing the four issues which will be compiled into a trade paperback and eight issues in the Karl Vincent: Vampire Hunter series have been completed. He has started work on Foul Blood, and every page he has been working on can be seen on the Kickstarter page. Given is trying to raise $2,500 for his project by November 11, 2015 at 4:40 PM EDT. For $5 or more you will get a digital copy of Karl Vincent: Vampire Hunter #1. For $10 or more you’ll get both a digital copy and a hardcover copy signed by the writer. Other rewards are listed on the Kickstarter. Me: Why did you decide to adapt this particular novel series into a comic book? Kevin Given: I wrote the novel first, then turned it into a screenplay. I always had the intention to turn it into a comic book series. I've been a big fan of comics since I can remember. Me: There are a lot of vampire stories which have received great acclaim. How does your story stand out from others? Given: Karl is a bumbling oaf of a vampire hunter, which makes him different than your self-assured Vampire Hunter. He wets his pants every time he sees a vampire. The original idea came when I was watching an old Don Knotts movie called The Ghost and Mr. Chicken. I thought, "What if Don Knotts were a vampire hunter?" Then I started to create the character. Inspiration came from the old Night Stalker TV series with Darren McGavin and the original Fright Night movies with Roddy McDowell. Then I had my artists draw Karl to look like me. Karl was a detective with a wife and kids. Barbara was his wife and his kids were Keith, Jeff and Julie. Karl announced to Keith's high school class one day that he was going to quit his detective job to hunt vampires. After that Barbara filed for divorce and Keith won't even talk to his father anymore. 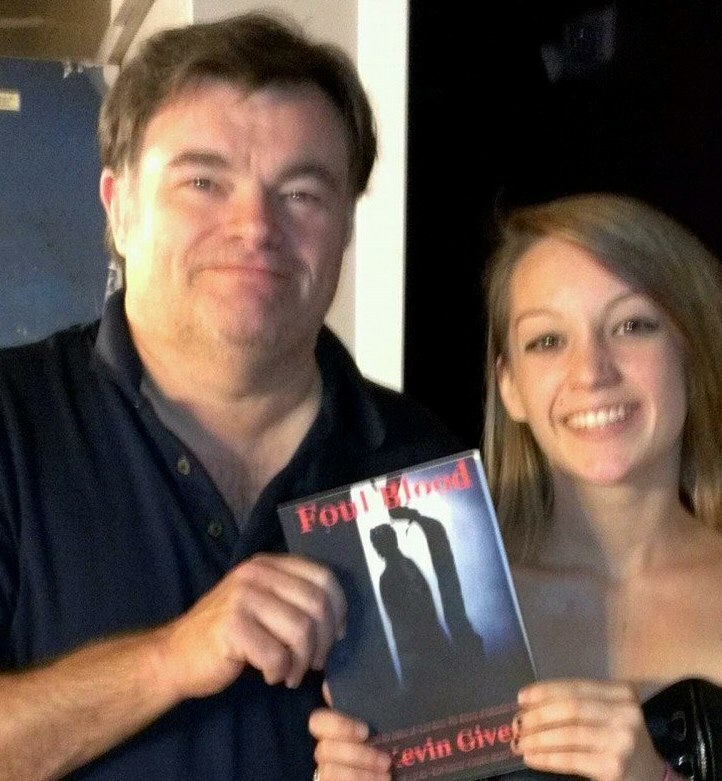 He was fired as a detective and now works as a paranormal investigator. He lost everything in his life to hunt vampires. Me: What was your favorite book of the series to write so far and why? Given: Foul Blood was my favorite book to write because I think the story flows a little better and we get to know Karl and see what motivates him to fight vampires. It reads like the old noir mystery novels from Dashiell Hammett, Raymond Chandler or Mickey Spillane. I believe I found the right mix of horror and noir with this one. Me: What are some of your favorite vampire stories? Given: I love Marvel comics Tomb of Dracula. As I mentioned before Night Stalker and Fright Night plus the movies Lost Boys, Near Dark, John Carpenters Vampires and the old Dark Shadows TV show. In fact, Barnabas Collins was my first encounter with a vampire as a kid. Those are just a few. Me: How did you come to work with Edward Stinson III and Kenneth Carolli on this project? Given: I found them through a company on the internet. My original artist, Scott Story, wasn't available so I searched the internet until I found them. I went with them on this series because they reminded me a little of Gene Colan who did the original Tomb of Dracula. The prologue to the book has that eerie feel I wanted. Me: You also mentioned that Karl will appear in Glaister Silverback Ormsby's "Hell and Holy Water" and Silverback’s character of Jayson Helstrom will appear in this issue as well as Issue 2. Could you tell me more about this other series and character and how it came to be connected with Karl Vincent: Vampire Hunter? 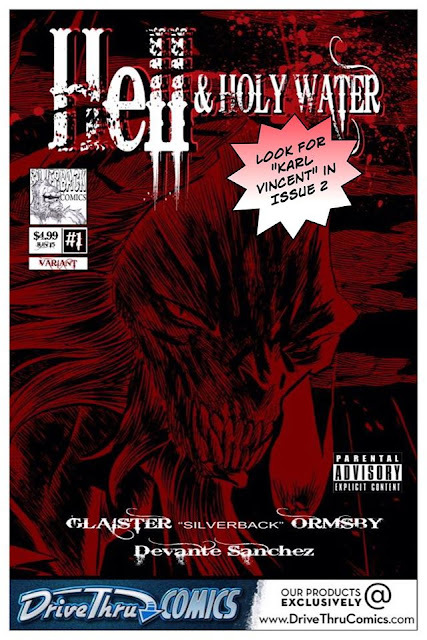 Given: I found Glaister's fund raiser on Kickstarter and he had, as a reward, appearing in a Hell and Holy Water issue, so I contacted him and told him about the Karl Vincent series and we put each other's characters in our issues. Me: Since Karl Vincent: Vampire Hunter will be adapted into a movie, can you talk about the people involved in making this into a film? Given: Jeffrey Crisp and Crisp film works found my script for Last Rites on a website where producers go to find projects and, as luck would have it, I had just returned to Florida after living in the Pittsburgh area for several years. Production begins on Last Rites November 14. 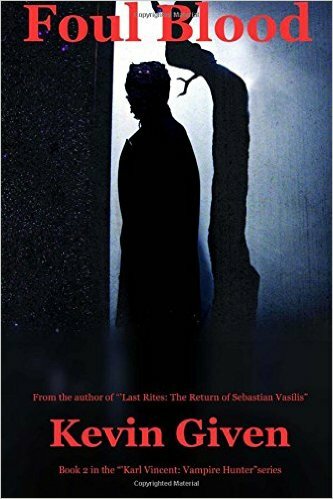 You can find more information on Facebook's Karl Vincent: Vampire Hunter and Last Rites - The Return of Sebastian Vasilis pages, please like and follow both for updates on the film. I'm hoping to proceed with Foul Blood once production is done on Last Rites. Me: How does the story differ in novel, comic book and movie formats? Given: In the novel, Lyle isn't with Karl when they discover Constance Haight's body. He had just lost his partner, Trevor Jackson, and Captain Fiedler is with Karl when her body is discovered. Lyle is introduced later. Also, more detail is given to serial killer David Reynolds’ past and crimes. Karl is constantly remembering details from his former interrogations of Reynolds when he was captured and put away in the first place. The novel shows how Reynolds got under Karl's skin and Karl's fear of Reynolds. Me: How did it feel writing in three different mediums? Which format do you enjoy working on the most and what would you say are the advantages and disadvantages of each? Given: Well, the screenplay and comic book were the same for me because I sent the script to the artists and they used that as a guide to draw the comic. Screenplay writing is easy and doesn't take as long but I enjoy writing the novels most. Nothing gets my adrenaline pumping like sitting in front of my lap top and churning out another adventure. I can get into the characters’ thoughts and give them motivation, attitude and conflict much better than I can when writing a screenplay. Screenplays are action only. Me: How would you describe Edward Stinson III and Kenneth Carolli’s artwork in the series? Given: The artists are basically drawing this comic based on the screenplay. Edward Stinson III and Kenneth Carolli’s artwork has a very gritty and realistic look to it that enhances the whole dark noir atmosphere I was going for in this work. They're very different from any other artist I have used. Me: What are your future plans for the Karl Vincent: Vampire Hunter series? Given: We're planning the sequel to Last Rites, working on the script and the novel for that one. I'm excited about the direction it's going in. The working title is Dracula Rising and will introduce Dracula into the series. It will also reveal a link between Karl and Sebastian. Every good protagonist/antagonist relationship has a link between the two. Batman and the Joker both suffer from the same psychosis, Bruce Banner is dating the daughter of the man that wants to destroy his alter ego, and this story will see a link between Karl and Sebastian that will change the way they see each other. I'm really excited about this story. 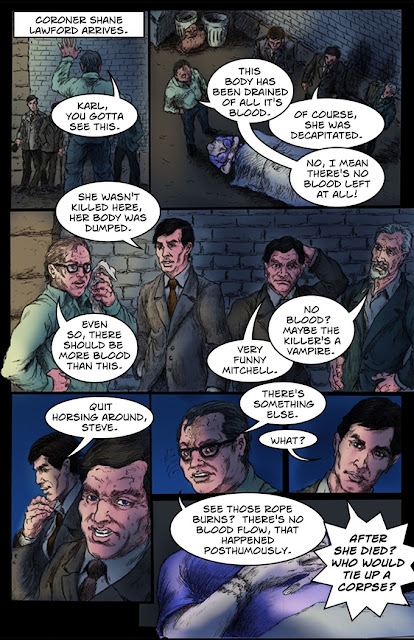 Me: What can backers expect to get the Karl Vincent: Vampire Hunter: "Foul Blood" mini-series? 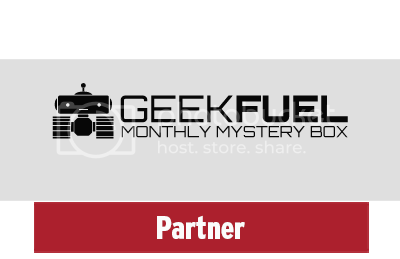 Given: Rewards for people who back the Foul Blood campaign include all eight existing comic books in digital and hard copy. Plus some will be able to cameo in a Karl Vincent comic book. You can be a vampire, vampire hunter or any character you want to be. Me: When can backers expect to get the Karl Vincent: Vampire Hunter: "Foul Blood" mini-series? Given: I'm hoping to have it done by March, if I get the funding I need. Given: The only advice I can give aspiring comic book people is DON'T GIVE UP! Me: Thanks for your time Kevin. You can back the Karl Vincent: Vampire Hunter: “Foul Blood” on Kickstarter.